I suppose that Mother's Day is as good as any to take the first official baby bump photo. This time around it has been less fun to see myself in pictures because it means I really look like that! Yikes! When did that happen? 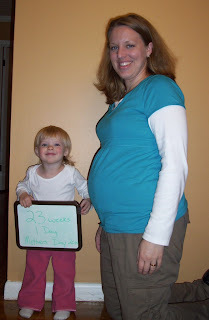 The photo was taken on Mother's Day at 23 weeks and 1 day. I can't believe that we are already halfway through. Wow! Here are some other pictures of our Mother's Day events. 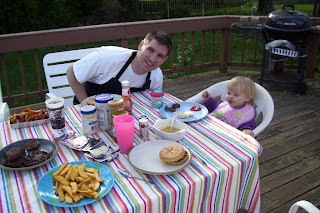 On Saturday, Kevin grilled burgers for us (with a portabella mushroom for me) and we ate on the back porch. Avery loved them and almost ate an entire hamburger patty all by herself! On Sunday, Kevin grilled again and this time made ribs (my favorite) and pork tenderloin. We were joined by some great friends and had a feast! 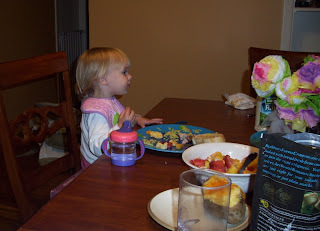 Avery decided she wanted to sit in a big seat without a highchair since the other kids were eating that way. This is really the only picture of that meal, but we will remember it anyway. I hope all you Mothers out there were wonderfully celebrated. Our jobs are priceless! 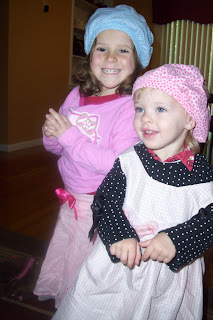 Being a proud mom doesn't end when your child hits the toddler age! You look amazing with that child growing inside you! Avery is BEAUTIFUL and so fun! Kevin's grilling is making me drool, can't wait to get there. Happy Mother's Day to my precious and amazing daughter! Just heard that you guys are expecting another little girl. congrats! Erin and I are also expecting a girl in July. 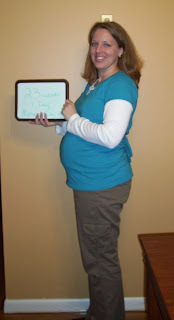 We're now three weeks from our due date (July 10th)!